This textbook chapter introduces the concepts of static and dynamic equilibrium, and discusses contemporary climate change. The greenhouse effect is presented in a discussion of Mars, Venus and Earth, the "Goldilocks" planet. Two investigations support the chapter. The resource includes links to current news articles, and a suite of pre- and post-unit assessments. A teacher's guide supports classroom use. 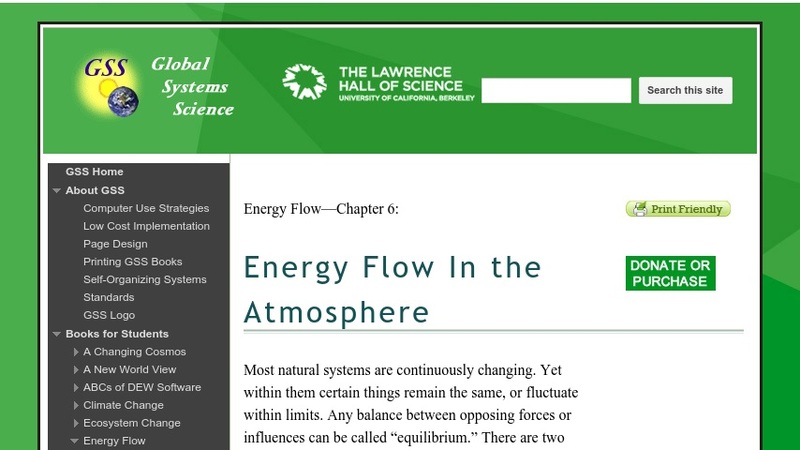 This is the sixth chapter in the unit, Energy Flow, exploring the flow of energy through the atmosphere, oceans, land, and living things over short and long timescales. The resource is part of Global System Science (GSS), an interdisciplinary course for high school students that emphasizes how scientists from a wide variety of fields work together to understand significant problems of global impact.